CARAVAN registrations have grown 30 per cent nationally in five years, says the Caravan Industry Association of Australia. 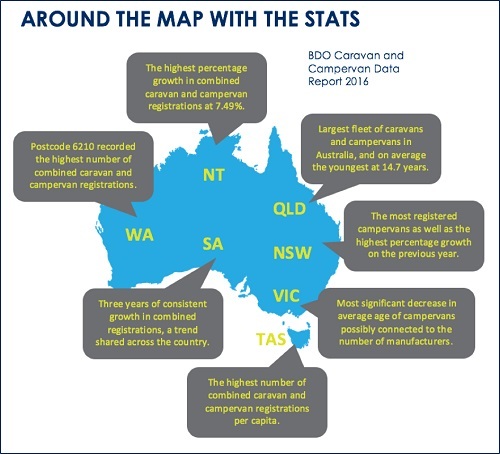 In its latest BDO Caravan and Camping Data Report, the association discovered that campervan registrations increased 20 per cent in the same period. Combined registrations of caravan and campervans peaked at a record high of 615,301 for the year ending January 2016. This represents 4.9% growth on the previous year and makes recreational vehicles the fastest growing vehicle registrations by type in the country. This total number is made up of 554,34 caravans and 60,957 campervans, a ratio of 90% caravans and 10% campervans that has remained largely the same in the last year. The figures go some way to explaining the success of businesses such as Apollo Campers and Zone RV. The average age of registered campervans is 17.8 years and this indicates that potentially two thirds of campervans on the road will be due for replacement in the coming years. Breaking it down further, 65% of campervans used diesel fuel and 74% had a tare weight of between 1,000 and 5,000 kilograms. In the caravan segment, 67% weigh less that 1.5 tonnes, however, the largest growth in the last year has been in the 2 to 2.5 tonne range, indicating a trend towards bigger rigs or ones that are loaded with all the mod cons. Caravan Industry Association of Australia says the report highlights the increasing demand for the caravanning and camping lifestyle in Australia, which bodes well for regional communities that benefit from tourism generated by this sector.